Dan Nagengast, executive director since 1992, is leaving center for new opportunities. Kansas Rural Center plans to launch a search by early summer for a replacement for Executive Director Dan Nagengast, who plans to leave KRC on June 30. Nagengast has been Executive Director since 1992. 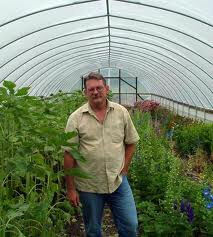 He and his wife, Lynn Byczynski, are buying an Italian Vegetable Seed business, to be run out of Lawrence, Kansas. Dan will continue to be involved in local food politics and activities in Kansas. The KRC board has appointed long-time staff person Mary Fund as Interim Director, effective July 1, until a replacement is hired. Fund is currently director of KRC's Clean Water Farms-WRAPS Focus Project, editor of KRC's newsletter, Rural Papers, and works on a number of other KRC projects. KRC, a non-profit education and advocacy organization for sustainable agriculture and a local and regional food system, was formed in 1979. Nagengast is one of only three individuals who have served as Executive Director over the organization's history. "After nearly 20 years as Executive Director, I've decided it is time to step back and turn over the reins to new leadership and for a new chapter in my life," says Nagengast. "I have been thoroughly engaged in the KRC's work of preserving opportunities in farming for Kansans for almost 20 years." Nagengast informed the board late last year that he was thinking about purusing other opportunities and they have been making transition plans. "We have a talented and capable staff who will continue to do good work. We have a committed board of directors who will be deeply involved in promoting sustainable agriculture in Kansas and making decisions for the organization's future," he said. Board co-presidents, Marjorie Van Buren of Topeka and Laura Fortmeyer of Fairview praised Nagangast for his years of service. "We are very sorry to see Dan leave, but we understand his desire to pursue new challenges and opportunities," they said in a joint statement. "The KRC and all who farm and eat in Kasnas owe him a great deal. We wish him and Lynn nothing but the best."